HashShine Review – Cloud Mining Scam or Legit Venture? “Grow your bitcoins” is the motto echoed from the creators behind HashShine.com. Coming off as a rather inconspicuous cloud mining operation, HashShine delivers what appears would be an authentic Bitcoin mining operation. Reflecting a sleek site interface combined with payment structures that fail to draw much attention, our instincts tell us that the creators behind HashShine are trying to stay an active investment scheme for as long as possible. Unfortunately for them, we are well-versed in identifying and exposing online investment scams. As you begin to swift your way through our detailed review, you will start to realize just how illegitimate of an offer that HashShine truly is. Promising returns that are far too high while operating as an anonymous cloud mining platform are just a couple of the areas we will dissect throughout this review. HashShine is an online investment platform geared towards equipping investors with the ability to virtually mine bitcoins. While no mention of data centers, which crypto hardware or any relative operational information is disclosed on the site, investors are left to ponder how exactly does HashShine mine bitcoins. According to their About Us, HashShine employs Bitcoin investing and trading in addition to their mining operation in order to manage and create wealth for their investors. HashShine.com appears to offer crypto investors an opportunity to have their Bitcoin deposits grow through the practice of cloud mining and investing. Unlike most cryptocurrency platforms that we come across, HashShine does not offer any account packages but instead a fixed return rate of 3.84% daily on your original deposit. 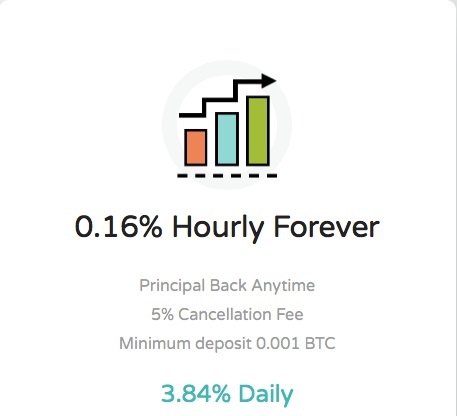 The minimum deposit required is 0.001 BTC while no max deposit limits have been issued. Investors who wish to partake with HashShine must exercise caution since only Bitcoin transactions are accepted and how a minimum fee of at least 40% will be applied to withdrawal requests following 24 hours after your deposit. Advertised just as strongly as their investment program would be their affiliate program which is composed of a 3 level commission structure. HashShine.com does not provide any information regarding the creators, owners or corporate entity behind their operation. All potential investors have to go off of would be their address of 126 Aldersgate Street, London, EC1A 4JQ which also happens to be the address provided for over 200 corporations, so finding which corporation is backing them up, if any, is beyond our ability due to the little information provided on the site. Furthermore, their provided telephone number of +44 20 3514 5877 and email address [email protected] make this domain an anonymous operation. A WHOIS report will go on to reveal that their domain, HashShine.com, was privately registered so we cannot find information pertaining to the registrar behind this site. HashShine does not possess any backlinks or shares any affiliation with any legitimate sites to date. Does the website promote unrealistic returns on investments? When compared to verified and legitimate cryptocurrency platforms, yes, HashShine promises ROIs that are unbelievably high and unsustainable for the long-term health of a business. Promising a daily return of 3.84% equates to a cumulative return of over 1,400% for a calendar year. The deeper you dig into the HashShine platform, the more apparent it becomes that every element is fabricated, take for example their poorly photoshopped payment method badges. Does the site evasively elaborate their operational model? We wished the creators behind this site would have attempted to explain their operational procedures, but they don’t mention anything besides cloud mining and Bitcoin investing. As previously stated, no mention of which mining hardware or investment practices are shared anywhere on their site. HashShine.com possesses a SimiliarWeb global rank of 37,288,491 as of December 2017. This report indicates to us that HashShine is not a popular investment platform and receives minimum amounts of traffic. HashShine is a poorly constructed platform that fails to render a service of any significant value. A deposit through their platform will almost certainly resort to the theft of your bitcoins. Save yourself from frustration and loss of funds by never investing with anonymous investment platforms or ones that fail to provide ample information regarding their operational model. Review Verdict: HashShine is a SCAM! Have you lost bitcoins to HashShine? Please report any experiences, feedback or thoughts you may possess by leaving a comment below! For those of you seeking more serious money making opportunities, feel free to visit our Cryptocurrency Investment Guide. Admin..pliss check ltcminer..is legit or not?